What is the Lord’s Supper? What is the Eucharist? Was it always understood as a Sacrament? Throughout the history of Christianity, the overwhelming majority of Christians have consistently believed that Jesus Christ, in a mystery, imparts His Body and Blood to His people though the vehicle of the Lord’s Supper. Bypassing all the Biblical references, here is a small, non-exhaustive sampling of what they’ve had to say in every generation. If you’re going to read any of them, please read them all. “Since then He Himself declared and said of the Bread, ‘this is my Body’, who shall dare to doubt any longer? And since He Himself affirmed and said, ‘this is My Blood’, who shall ever hesitate, saying that it is not His Blood? He once, in Cana of Galilee turned water into wine, akin to blood, and is it incredible that He should have turned wine into Blood? Concerning the Two Natures of Christ, Thiel. Ep. Pontiff, p. 541 f.
And finally one who didn’t. Influenced by the rationalistic spirit of the Renaissance and reacting to abuses in the Roman Church, a small segment of Reformation churchmen, centered around Ulrich Zwingli, began to view the Lord’s Supper as an empty symbol, a Real Absence of Christ, instead of a vehicle of grace. 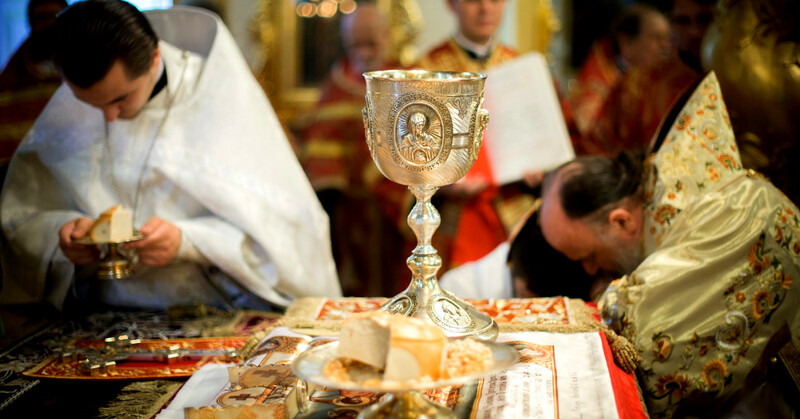 Much of modern American Evangelicalism has taken its view of the Lord’s Supper from the Gnostic Zwinglian tradition, rather than from the mainstream of historic Incarnational Christianity. Althought a multitude of examples could be quoted, Zwingli has stated the case most succinctly, and substantially speaks for them all. The Orthodox Church, as the historic Church of Christ, has maintained the Lord’s command, and the Apostolic teaching, often at great cost, for the last 2,000+ years. Eucharist: Mystery or Memorial? Sacrament or Symbol? What is the Lord’s Supper? What is the Eucharist? Was it always understood as a Sacrament? Throughout the history of Christianity, the overwhelming majority of Christians have consistently believed that Jesus Christ, in a mystery, imparts His Body and Blood through the Eucharist to His people. Bypassing all the Biblical references, here is a small, non-exhaustive sampling of what they’ve had to say in every generation. If you’re going to read any of them, please read them all.